Remove 1 tablespoon yogurt from yogurt container. Stir in 1 tablespoon of the almonds and 1 tablespoon of the granola bars. Top with remaining almonds and granola bars. Removing 1 tablespoon yogurt from container makes it easier to stir ingredients. Enjoy the spoonful before stirring in almonds and granola bars. 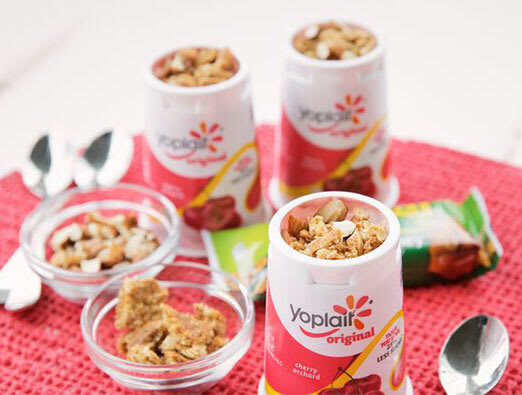 Try this yogurt cup with Yoplait® Greek 100 black cherry yogurt (no need to remove 1 tablespoon yogurt from yogurt container). Use Nature Valley™ crunchy granola oats ‘n honey in place of crushed granola bars, if desired.